Last week, I asked for reader suggestions for this week's Virtually Overlooked. One reader suggested The Guardian Legend, and I thought that was a perfectly reasonable suggestion. The Guardian Legend was one of the biggest sleeper hits of the NES era, and something that is definitely worth checking out, especially for fans of Ys and Faxanadu. It was only later that I realized that I was thinking of Legacy of the Wizard. I get those two mixed up a lot. They both fall into that "sleeper" category, they were both published by Brøderbund, and they both have "Leg" in the title. They're practically the same game, except that one's a hybrid vertical shooter/Zelda-style adventure developed by Compile, and the other is a side-scrolling action RPG from Nihon Falcom. But other than that, the same game. Inspired by my inability to keep two similar things separate, I thought this week we could look at some more NES games I get confused about, either because they're so similar or because I'm so dumb. Both of these are top-down tile-based puzzle games with adorable characters. I should be able to remember that Kickle Cubicle is the one with kicking, but I never can. I always hated these character puzzle games, which is why they all run together. I'm sure I'll get kicked out of Nintendo fandom for not liking Lolo. This is just not fair. Look at the hats. I'm never going to be able to get these straight. I think Mystery Quest was specifically designed to confuse people into thinking it was Milon's Secret Castle. Maybe Taxan figured that was the only way it would sell. Anyway, saying I get it mixed up with Milon's Secret Castle is probably the nicest thing I can say about Mystery Quest. That's like complimenting someone's hair by saying that you confused it for your neighbors' 14-year-old cat. 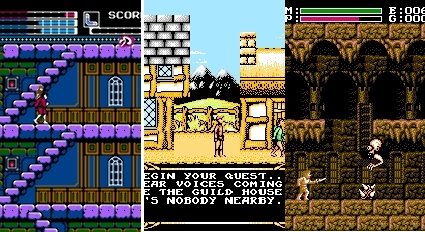 Faxanadu is a genuinely good game, but it also looks just like every other side-scrolling RPG ever put on the NES. Maybe a little browner. 8 Eyes is kind of unique in its non-uniqueness: it's actually a Castlevania clone that also manages to look like these other games. I actually don't remember Magician at all, except for the fact that I rented it at least twice when I meant to rent Faxanadu. These games aren't similar in the least-- they just happen to both be side-scrolling action games that involve East Asian themes (kabuki in the former, jiangshi in the latter). Also they both end in -um Fighter. I hope someone out there sympathizes with regard to at least one of these. Otherwise, I'll feel stupid and very exposed.